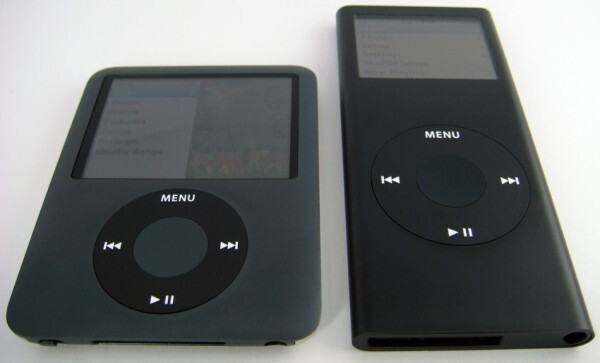 To describe the iPod Nano right off the bat, it’s pretty much a tiny version of a iPod Classic. The unit looks elegant and impressive because of its size. The Nano stands just 2.75-inches tall, 2.06-inches wide, and only .26-inches thick. It is the same thickness as the 2nd generation Nano. The front is made of a anodized aluminum and the back, unlike its predecessor, has the classic shinny steel material, which is easy to scratch. Because of the dimensions and the material, the 3G Nano unfortunately seems to be a whole lot more delicate than the 2nd generation. The standard touch sensitive click wheel can be found right below the screen, but it is abnormally skinnier and smaller. The wheel was a bit more difficult to use compared to the older Nano, however wasn’t really a problem after a few minutes of use. Apple has managed to move the hold button, the headphone jack, and the dock connector to the bottom, leaving nothing behind at the top. The rest of the controls such as volume and brightness are all managed through the interface using the click-wheel. The 2-inch (diagonal) LED backlit LCD was bright, clear, and sharp enough to watch videos on. It once again is the brightest iPod Nano screen yet. The resolution is a standard 320×240 which plays at a max of 30 frames per second. One thing that makes the screen look different is the gap found between the body and display which creates a different effect. The Nano can playback both 4:3 and 16:9 clips by formating and resizing the video to best fit the display. As always, Apple has managed to vastly improve the iPod’s playback time. According to Apple, the battery can offer 24 hours of audio playback or 5 hours of video playback. From our test, with the brightness slightly lowered and at a normal listening volume, we surprisingly found it to last much longer than advertised. Although this is better than any previous iPod, it still remains on below what’s offered by other flash-based portable multimedia players from Creative, Sony, and Microsoft. 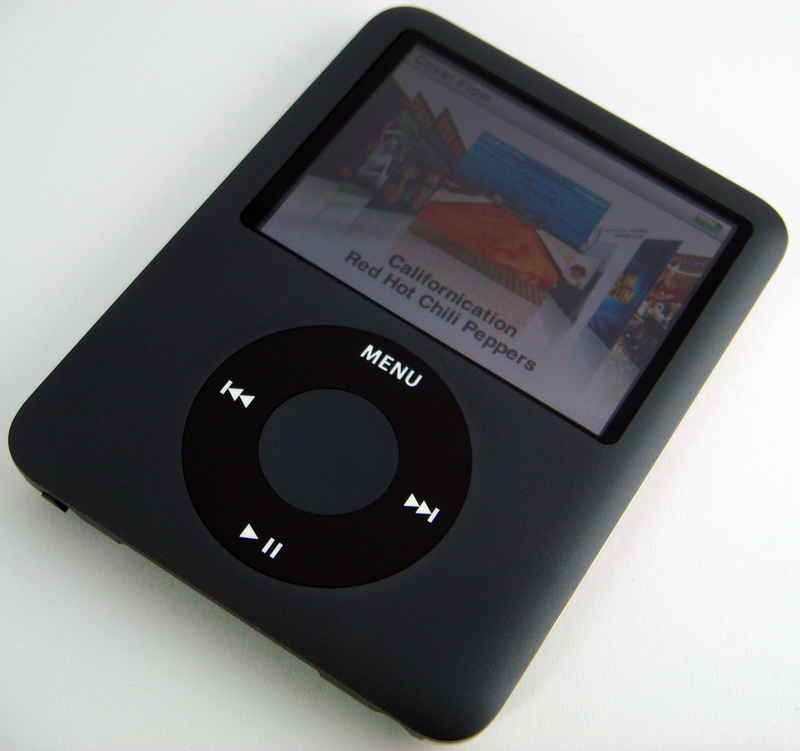 In general, just about any major format of audio will work with the iPod Nano. 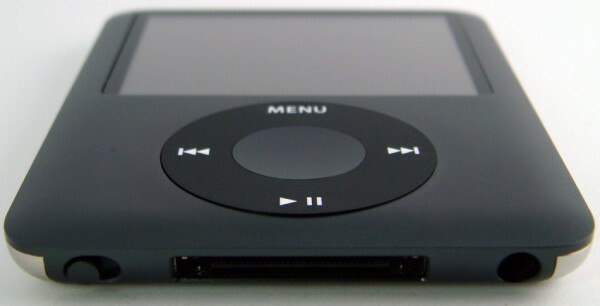 The iPod can playback AAC, MP3, Apple Lossless, WAV, and music purchased from iTunes. The Nano also supports playback of DRM-Free files from Amazon’s new MP3 Store and obviously iTunes Plus. For video the 3rd generation Nano supports MOV, MP4, or M4V files encoded in MPEG-4 or H.264. Apple iTunes does a fairly good job of converting most content into a compatible format. And for photos, the feature I personally rarely use, it can read and display JPEG, BMP, GIF, TIFF, and PNG images. The new interface is one of those things you love, but hate. The Nano now has a new default split screen view which displays the standard menus on the left, while displaying moving album artwork thumbnails on the right. Although this looks beautiful, we felt is slowed down browsing through the library by a lot. The Nano now can do neat things such as displaying Artwork next to each album or adding an extra line of information below each song, which saves having to return to the previous menu to find out what it was a part of. Although I’m not a big fan of Cover Flow, Apple was impressively able to get it to run on the Nano fairly well. It remains a bit sluggish, but it’s pretty good for such a small device. (Even my laptop struggles to run it on iTunes) The reason we took away two points was because the interface was horribly buggy. We often found that the menu would display the wrong number of songs or albums. We also entered menu’s that didn’t or shouldn’t exist. For example we entered a weird menu by clicking on the play button over a podcast folder instead of hitting the center button. Overall it’s a major UI overhaul, which is great, but honestly such a major mainstream product shouldn’t have any problems. Hopefully Apple will roll out a firmware upgrade fixing these issues. Another which annoyed me was that all the settings were no longer in the same place. For example some settings for Video could only be modified from the Video menu, not form the Settings Menu. Hopefully they’ll keep everything in one place, it will be a headache to have to visit a different menus to each type of setting. Our experience with syncing media was just as we expected it to be, excellent. The only thing I wish the iPod Nano could do is to allow dropping files right onto the device without the need of iTunes. If you were to do so with a current iPod, the file would just be stored on the device and would never appear anywhere in the interface. But if you are using the latest version iTunes, everything works great. Managing songs, videos, and photos is a cinch. You can manually manage content or ask iTunes to take care of it for you. 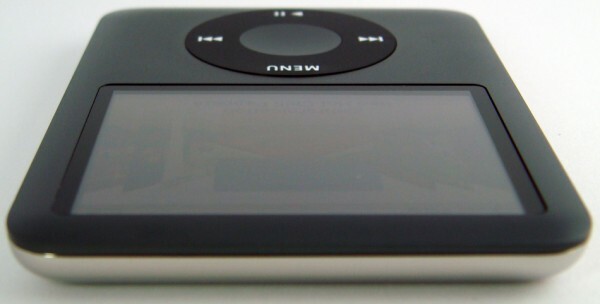 The iPod Nano even doubles as a flash drive unlike the iPod Touch. When you open your neatly and fancily packaged box from Apple you’ll find a set of standard iPod earphones, a USB 2.0 cable, a Dock adapter, and a quick start guide. As always, we recommend upgrading your generic headphones to something along the lines of Shure’s SE110 which will offer a very different experience. Finally no software is included, therefore an internet connection is required to acquire the latest version if Apple iTunes. So in conclusion, we weren’t too impressed with the iPod Nano, but it is a great upgrade on some levels compared to its predecessor. We would recommend upgrading if you want the ability to playback video, which worked very well. If you plan just to listen to music, there’s not too much else this device can offer. We in fact on some levels would recommend this over the iPod Touch for those on a strict budget. The 8GB Nano costs half that of the 8GB iPod Touch. As for the software bugs, it is only expected and natural for Apple to roll out some patches soon. The only other major problem we found was that it seems to be way more delicate than the 2G Nano. (Buy a case!) Anyways if you wish to purchase this, it’s now available in retail stores and online for $150 and $200 for 4GB and 8GB models, respectively. You should be able to find it for a bit cheaper from other retailers. We recommend this because it is one of the most affordable iPods yet and retains just about all the features that the iPod Classic has. well now after reading this i might not actually want to buy an ipod nano thx 4 lettimg me no! i just got this ipod nano a few days ago and i agree that the menus are all sloooowwww. i had the old one with the shinny back before and it wa so much faster. i needed more space for my music otherwise i would not have gotten this one!!!! Heyy!I have this one too…That’s why thanks for info!